Visit our Stop C-51 Campaign website here. The Communist Party of Canada fully supports the various mobilizations of labour, community and student groups, as well as democratically-minded people, against omnibus Bill C-51. A cross-Canada day of Action has been proposed for Saturday, March 14th. The initiative is being promoted by Lead Now, Open Media, the BC Government Employees Union as well as the BC Civil Liberties Association which is calling for withdrawal of the legislation. We urge all people to help build, broaden and strengthen these events and actions in localities across the country. Visible public opposition to the Bill – which is now clearly being railroaded through Parliament by the Harper Conservatives – is crucial to blocking this anti-democratic legislation and preventing its passage. As we said when C-51 was first released, this Bill constitutes perhaps the most serious threat to free speech and civil liberties in Canada since the era of the War Measures Act. More than just cynical electioneering by the Harper Conservatives, the Bill reinforces and expands the existing and already dangerous powers of CSIS and helps promote war and racism. Through deliberately ambiguous language, C-51 opensthe door to the suspension of Habeas Corpus and a policy of “collective punishment” of whole communities, on the basis of political ideology or being part of a racialized community. C-51 is a police state-style law and a dangerous threat to the labour rights, civil liberties, and democracy. As with earlier anti-terrorism legislation passed in 2001 and 2013, C-51 cannot be amended and must be rescinded. A growing chorus of criticism has emerged against the Bill. We urge all those who care about civil, labour and democratic rights, to continue to help build a powerful, mass, united campaign. The day of action has events planned in Victoria, Vancouver, Edmonton, Calgary, Winnipeg, Toronto, Ottawa, Montreal, Halifax and several other cities. Such a broad-based fight can win, by mobilizing public opposition right across the country! 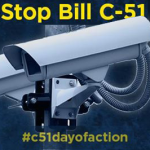 Join the March 14th Day of Action against C-51! You can link to the Day of Action event page here.